SEATTLE, Washington -- Salmon are beginning to swim up the Elwha River for the first time in more than a century. But University of Washington marine geologists are watching what's beginning to flow downstream � sediments from the largest dam-removal project ever undertaken. The 108-foot Elwha Dam was built in 1910, and after decades of debate it was finally dismantled last year. Roughly a third of the 210-foot Glines Canyon Dam still stands, holding back a mountain of silt, sand and gravel. Removal of the upper dam was halted in January while crews repair a water-treatment plant near Port Angeles that got clogged with leaves and other debris. For engineers, this phase may be the trickiest part of the dam-removal project. For oceanographers, "the best is yet to come," said Charles Nittrouer, a UW professor of oceanography and of Earth and space sciences. It turns out there is even more sediment than originally thought � about 34 million cubic yards. That's more than 3 million truck loads, enough to bury all of Seattle in a layer almost 3 inches thick. Aerial photos show sediment starting to fan out around the river's mouth. "One of the risks of just looking at these beautiful plume pictures is that you really don't know the extent of where that sediment actually ends up," said Andrea Ogston, a UW associate professor of oceanography. "Our focus is looking at what's happening very close to the seabed � how it's going to move, where it's going to get to, what's its ultimate fate." For the past five years, Ogston and Nittrouer and their students have been studying the sediment around the river mouth, initially with the support of Washington Sea Grant, to understand the condition before the dams' removal. Their current project, funded by the National Science Foundation, is looking for events that could act like a hundred-year storm and bury the sediment deep in the ocean. The UW researchers have instruments to track particles in the water and record them accumulating on the ocean floor. They are on high alert for a rapid response when the river floods and dislodges the sediment. When that happens, they want to be onsite to record as much data as possible � and perhaps be the first to witness a rare geologic event. In nature, deep-sea sediment flows triggered by earthquakes or extreme storms can be important for creating oil reserves and other geologic deposits, as a component of the global carbon cycle, and responsible for burying communication cables. Computer models and the geologic record suggest that when the sediment is in high-enough concentrations, it goes directly to the ocean floor. Instead of the fresh river water floating on top of the seawater, the river water becomes denser than the sea, and the sediment-laden river water plunges below the ocean water. For the Elwha, that path would take much of the sediment away from the coastline and deep into the Strait of Juan de Fuca. "A surface plume is very much at the whim of the winds and tides, whereas these underflows are just going down the steepest gradient," Ogston said. "These are two very different mechanisms that would create very different impacts to the seabed." The dams initially powered a pulp mill and were built unusually close to the ocean � the upper dam is just 13 miles from the river mouth. Their removal provides a unique opportunity to study large river discharges. "There is an understanding of the general type of flow, and people have predicted that it occurs in rivers, but no one has seen the smoking gun yet," Nittrouer said. "This is a chance to document a 100-year storm. It's really somewhat new territory." So far there have been dramatic changes to the seabed in the shallows, but few changes below about 20 feet, Ogston said. Where the sediment ends up is of practical interest. Sediment can make the water murky, creating conditions that make it difficult for salmon to lay eggs, or block light from reaching algae and other life on the ocean floor. On the other hand, the sediment also has positive impacts. Many people hope that removing the dam will help with erosion along the Olympic Coast. 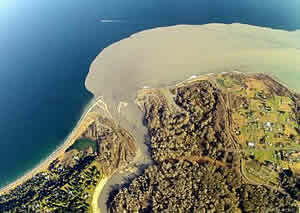 The new sediment could accumulate and restore natural beaches on the bluffs near Port Angeles. A better understanding of sediment transport could also help determine the timing of future dam removals. "One of the arguments is that rather than having a river that's unacceptable to salmon for many years, you can accelerate the erosion to flush the system. That way you have two or three really bad years instead of two or three pretty bad decades," Nittrouer said. Future projects might be trickier, he added, if the sediments contain pesticides or other chemicals. Nobody knows when the Elwha's sediment mother lode will begin to shift. A heavy rainfall combined with spring melt could dislodge the heap; if not, next fall and early winter rains will do the job. Either way, the UW marine geologists will be ready to hop in their van, hitch up a boat, and race out to see what happens. "This is a very exciting time," Ogston said. As a teenager I had the opportunity to pack into the Elk Horn Ranger station along the Elwha River two occasions as well as packed in on foot multiple times. We were far above the dams and enjoyed the crystal clear, and incredibly cold, water that the Elwah offered. I am a Lay Person when it comes to taking down dams,and dealing with the silt. I am, however, a person who has spent some time reading up on the coal silt and what happens in terms of destruction when a sediment pond overflows the dams and destroys everything in its path. I also had experience as a post flood volunteer in August of 1975 when there was a flash flood in Estes Park CO that flooded the Big Thompson river and canyon leaving everything under several feet of silt that was unlike anything I had ever encountered. It got into everything, and would not leave! It smothered the life out of everything living in the river. It smothered the life out of any grass or plants it covered. I would urge caution, as a lay person, in letting all of that silt go at one time. On the other hand, two decades of letting it drizzle out and wreak havoc on the spawning Salmon is, I am sure, the worst of all options. When the word silt is used along with the words spawning Salmon, pristine mountain glacial streams and rivers, it is going to raise a lot of good questions. an interestng article. Is there a possibility that in a few years there will be more salmon available for human consumption? As our population increases,. we'll need more food sources. Just a thought. How much pesticide is in the sediment? Probably way more than anyone imagines... it's in Washington state. But at least the fish won't have to worry about insects eating 'em. Hopefully they won't start crawling out of the ocean and eating us! Whoa? Exciting to study the sediment destruction on the Elwha River and ocean for ripping out a renewable energy source with our taxes adding to the billions of debt? Isn't it illegal to destroy a renewable energy source? And we US taxpayers are supposed to clean out the natural sediment and create a new chic tourist recreation area for the state of Washington in place of the lake? We are cutting jobs, food for the Seniors and WIC (women infant children) programs in the "sequestration" so we can do this? I watched with great interest the television program on the removal of the Elwha dam. Since there is valid concern for the amount of sediment behind the Glines Canyon Dam, would it be reasonable to time the removal of the Glines dam with the normal rain/snow melt season to insure there would be a high volume of water to help move the sediment to the ocean? I ask as a layman, but as I read the article it seems the the large amount of sediment would require additional flow.I have witnessed the damage done from a dam failure at Estes Park,CO as Mr.Barry commented the damage and loss of human lives,is still seen if you drive from Estes Park through the Big Thompson canyon to the start of the trail leading to the site of the failed dam. What seems to be wise at the time of construction,proves to be harmful to the generation that follows. Restoring natural systems and especiallly rivers is a sign that we're seeing the light�finally. Fictitious "money" is no object, quite literally, and the true physical value of a healthy environment is priceless. Would this be the same as the Mississippi flowing into the Gulf of Mexico. Compare Galveston Beach with any Gulf of Mexico beach from Panama City,FL to Key Largo? Folks are you from WA? Well here's an idea on why this was a good idea. This dam like many others in the state is/was very old and was not producing near enough power to justify its remaining in place. Some good ifo on Wikipedia and the net. The salmon are very important to the state and its people and economy. This project was in the works long before the sequestration. I feel that this is a great thing as long as the scientists do a thorough job of collecting the data and studying the affects to improve further projects in the future. Life can't stop and wait for the politicians or we'd all be screwed. To the best of my knowledge, Salmon don.t spawn/lay eggs in the ocean. They travel UP THE RIVER to spawn in the cleaner water near the river source. Removal of the dam is beneficial to the spawning of the salmon and in my opinion. yes there should be more salmon for human consumption in the coming years.